Prevention at Sea Ltd. unveiled an electronic record book, called ε-ORB, on 6th June 2016. 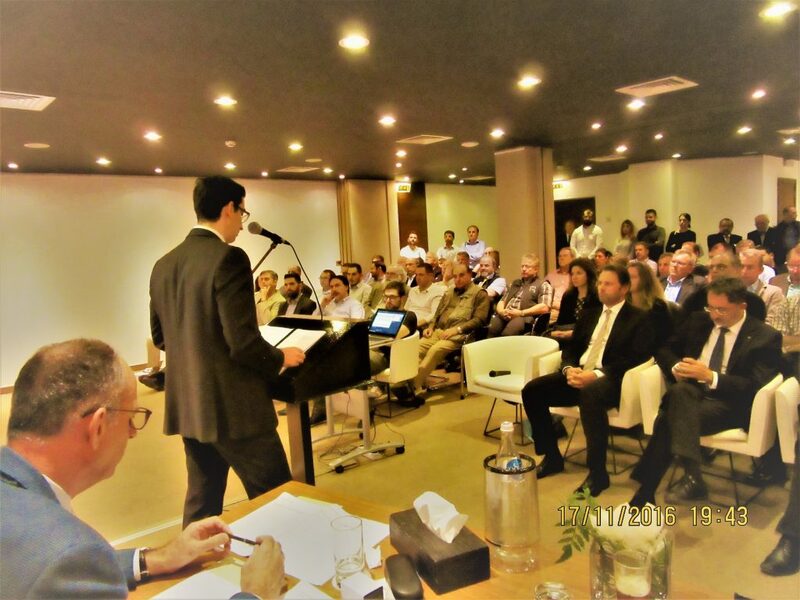 The Nautical Institute Cyprus Branch invited the Founder of Prevention at Sea Ltd., Mr. Petros Achtypis to speak about the issues with the currently used paper oil-record-books and how his company’s product solves the problem. The interest in the topic was evident by the full-house turnout with 95 participants. The Chairman, Capt. Graham Cowling welcomed the participants and speaker. He also spoke briefly about the benefits of joining the Nautical Institute and its Continuous Professional Development programme. Mr. Petros Achtypis started by highlighting the current industry problems where inaccurate or falsified Oil Record Books can lead to serious problems in port for a vessel including fines, detentions and environmental compliance programmes. Over one quarter of PSC-MARPOL deficiencies are due to incorrect entries in Oil Record Books. The ε-ORB has been designed to replace the traditional paper Oil Record Book and to establish software transparency, credibility and traceability. It is a Mariner friendly maritime software application; its installation by the user is easy and facilitates accurate ORB entries into an efficient electronic format. It simulates the same hard copy process in a digitalized form without affecting the daily routine of recording ORB operational entries. The concept of the ε-ORB is to provide a paperless solution for efficient record keeping as it is focused on preventing vague entries, incorrect ORB format and code mismatches. The ε-ΟRB supports automatic duplication of records between the fleet and their operator offices by using the communication systems already available on board. It is the first electronic ORB to be approved for shipboard use by the Liberia International Ship and Corporate Registry. It is also the first such product to be demonstrated to the US Coast Guard and European Maritime Safety Agency. It has also received a software conformity certificate from Lloyd’s Register. An inbuilt E- assistant called ‘Athena’ which guides the user through the completion process. The user can select from options. The ε-ORB can be completed without typing anything. Tools for assisting in calculation of tank volumes once the figures once the list and trim have been manually entered. Alerts in case of errors during completion. Drag and drop icons to make piping diagram. The premium version allows for biometric signature and pad. The product is currently used on Liberia Flag ships. Some companies who have ships with other flags are using the product as a guidance to fill the ORB. The company is currently meeting various Port State Control authorities to gain acceptance of the product. The office can see the same result as on the ship. The ship can be benchmark against other ships. A representative from the Cyprus Department of Merchant Shipping, Mr. Michael Agapiou spoke briefly to the audience about the acceptance criteria for such products. He described the reviews that would have to be done before it could be approved on Cypriot flagged ships. He stated that the ε-ORB was under review for approval. How are wrong entries dealt with? Can amendments be done on the ORB? No one can amend the entries once they are recorded. The amendment rights are available neither to ship or shore personnel. How to keep track of shore receipts? Scan as PDF and save. What happens if the computer crashes or is reformatted? The files are continuously backed up to an external hard drive. For a maintenance service, there is a backup available ashore with Prevention at Sea. Can Flag State have access to the ORB? It depends on the arrangement between the ship owner and the flag state. If there is an error in the ORB, can the ship manager get a notice in the office? The system does not allow for wrong entries. How are the costs of maintenance charged, for example for OS upgrades? As per usual practice, charged to client. On the Prevention at Sea website, you will find endorsements from Masters and Chief Engineers. Anyone can download a free trial from the company website www.preventionatsea.com. The Chairman thanked Mr. Petros Achtypis for the interesting presentation and the participants for the lively discussion. The interesting event was followed by a snacks and cocktail in the adjoining room.